When Giovanni Rossi, an artist and art restoration professional takes his wife, Chiara, to London, he is swept up in a suicide bombing at Covent Garden that embroils him in a series of schemes designed to foil the number one terrorist in the Islamic world. In Rossi’s real world, he is a legendary Israeli intelligence officer, Gabriel Allon, a role that places him squarely in the middle of the problem. Back at his home in the small village of Gunwalloe Cove, Cornwall, Gabriel finds his quiet life thrown into turmoil when the chief of Israel’s secret intelligence service informs him that he is now being called back into service. The bombing in Covent Garden is determined to be the third in a string of bombings, the first in Paris and the second in Copenhagen, that are seen as the work of a charismatic American-born cleric, whose ability to entice new members to the jihadist movement grows with each new attack. Gabriel’s assignment: to design a plan to prevent this man’s ongoing terrorist activities. To accomplish this goal, Gabriel brings in a team of specialists and as the plan unfolds, its success or failure depends on the recruitment of Nadia al-Bakari, a wealthy Middle Eastern businesswoman. The relationship between Gabriel and Nadia is complicated, as Gabriel happened to have assassinated her father many years earlier, but her compassion for the plight of Middle Eastern women plus her hatred of terrorism are the contributing factors to her participation. As the plan takes shape, Gabriel’s major concern becomes the safety of his primary “spy,” a challenge made more difficult by her ever present body guard, a man whose beliefs remain tied to established Islamic ways. It is not long before the details of the plan come to the attention of the Americans. The CIA makes its presence known and takes the reins through its funding and technology. Soon politics enter the fray as the Director of the CIA’s National Clandestine Service, and the Assistant to the president for homeland security and counterterrorism join in. Although Gabriel is assigned to work with the Director, the dabbling fingers of homeland security are never far away, always stirring the pot. All pieces of the puzzle are securely in place and move without the proverbial hitch, until the last moment, when Nadia is kidnapped by the very terrorists she and Gabriel have set out to foil, and it now becomes Gabriel’s responsibility to find her and save her. The plan, like a maze of well-clipped yew trees, twists and turns as it moves toward the inevitable ending, and yet like all mazes, a wrong turn can spell disaster—and that wrong turn appears in the character of a small player in Washington, DC, who is dissatisfied with his life, his home, and most of all, with the CIA. Unknown to Gabriel, this player is forcing the wrong turn in the maze that could result in failure. Daniel Silva writes with a clarity not seen by many of today’s writers. He has designed a delicious plot that moves with the speed of light. Each chapter leaves the reader teetering on the edge of the cliff, not sure how Gabriel and his team will save their plan from destruction. Mr. Silva’s choice of words in both narrative and description is precise to the picture he is painting or the message he is sending, and he puts the reader in the middle of the action at all times—never sitting on the sideline watching, but actually participating in the story. 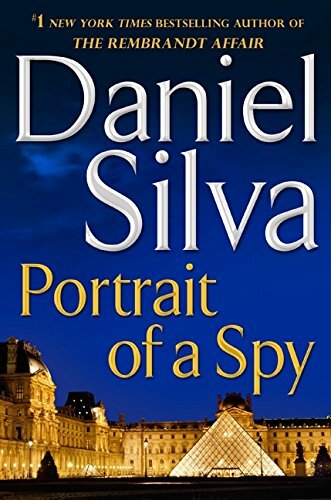 Gabriel Allon is a serial character familiar to Mr. Silva’s fans, and Gabriel’s role in Portrait of a Spy does not disappoint those who follow this involved and cleverly designed plot. Author Silva deftly steers the reader through the cliffs of Cornwall, the dark technology-riddled rooms of Washington, the brightly lit art galleries of London, and seedy tents of Saudi Arabia’s deserts—all of which Gabriel must navigate in order to bring the plan to a satisfying conclusion. Mr. Silva proves once again that he is one of the premier writers of espionage as he presents his story with an edgy darkness that catches our breath and then takes it away from us altogether.